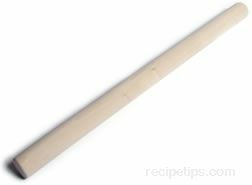 A kitchen utensil that is used to mark out a sheet of pasta dough when making stuffed pasta squares. 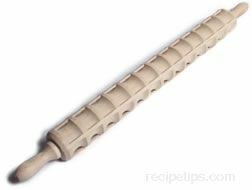 This rolling pin has indentations around the pin shaft that match the size of the stuffed pasta square to be cut. The sheet of dough is "marked" or cut with the pin. When the ravioli is prepared, the marked squares of pasta dough on one half of the sheet are stuffed with pasta ingredients, such as cheese or meat. The matching squares on the other half of the dough is then folded over to form the top layer. 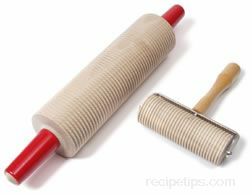 The squares are sealed or crimped around the edges and then sliced apart, into individual squares according to the markings from the rolling pin.